Whether humans' control of energy is good or bad depends on a person's point of view. Without humans being in charge, the human population would likely be similar in size to that of the populations of chimps or gorillas–in other words, tiny in comparison to today's human population. Furthermore, humans would be located only in the warmer parts of the world. As we will see in the next section, humans would not have evolved in the direction they did. Instead, they would have continued with only the abilities they had as pre-humans. They would have continued living in the wild, eating raw food and spending half of the day chewing it. (3) Pre-humans could use fire as a tool to burn down unwanted trees and bush, making it easier to capture prey and encouraging new plant growth of a type more suitable as human food. Also, the fire itself could be used to frighten predators. In Against the Grain, Scott finds that slave labor was very widely used in early civilizations. Male slaves were often used for tasks requiring heavy labor, such as mining and building roads. Today's fossil fuel energy slaves can do these things and much more. For example, a truck operated on a road makes liberal use of fossil fuel energy slaves partly to make the road, partly to build the truck and partly as fuel to operate the truck. 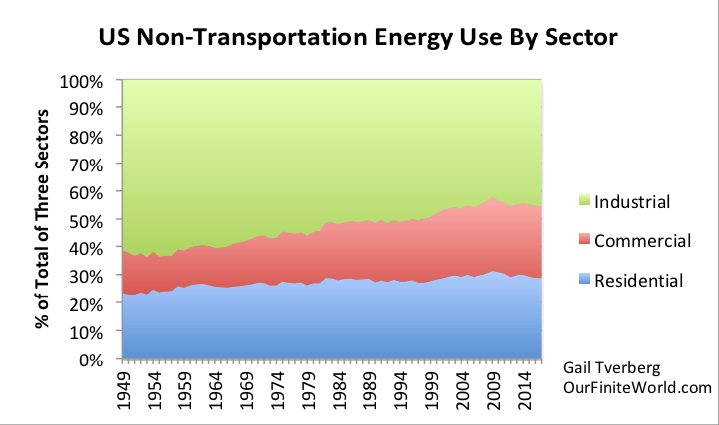 The residential percentage of non-transportation energy consumption rose from 23% in 1949 to 29% in 2017. We don't have a world estimate of the breakdown of energy consumption for residential use, but the United States is probably unusually high with its 29% residential share. According to a study by the National Renewable Energy Laboratory, China's energy consumption was only 11% residential in 2014. In a very real sense, the availability of inexpensive energy supplies that work to power existing machinery and equipment is what allows today's economy to function. 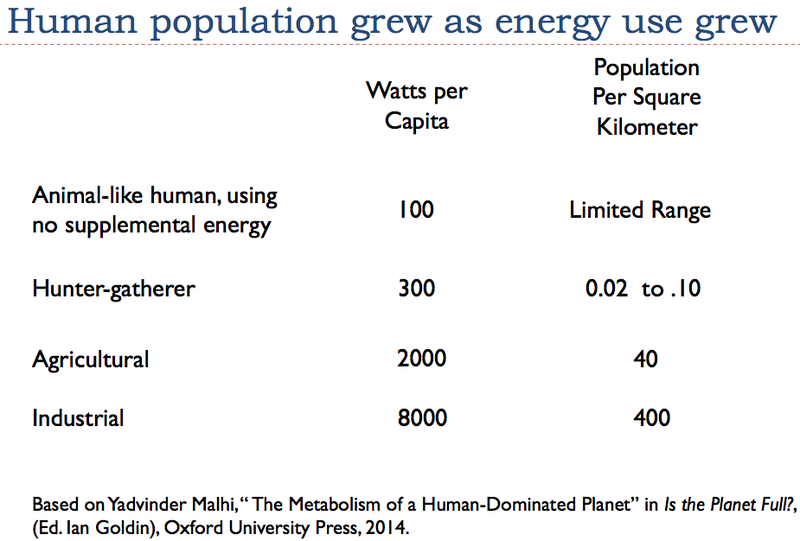 Humans have control of various types of energy supplies, in addition to food. These energy supplies make it easier to produce enough food for the overall population. People today are used to having things that wild animals do not have, such as clothing, education, climate controlled homes, transportation, medical care and retirement benefits. It should not be surprising that in our case, the first sign of reaching carrying capacity is something other than running out of food. In fact, the laws of physics suggest that the way reaching human carrying capacity is unlikely to be signaled by running out of any energy product, such as oil. Many people believe that oil prices are likely to rise very high, if there is a shortage. However, if wage disparity grows sufficiently large, any spike in prices is likely to be short lived. 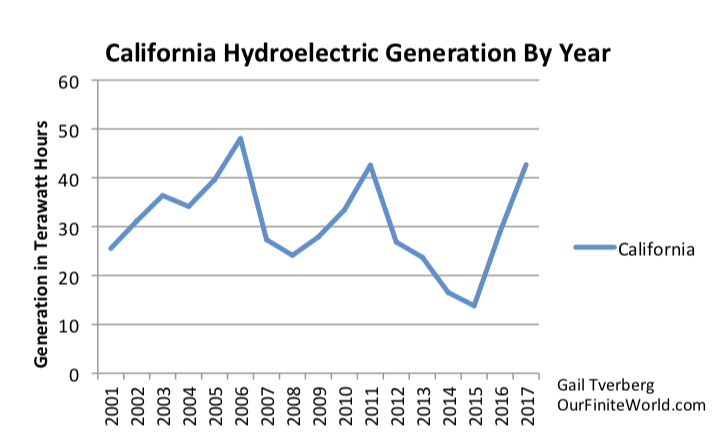 Instead, the energy limit that we are reaching may be that prices that do not rise high enough to encourage adequate production of energy products. Without sufficient production of these energy products, there will be a shortfall of finished goods and services. Physicist François Roddier in Thermodynamique de l'évolution : Un essai de thermo-bio-sociologie explains that when there is inadequate energy for an economy, the situation is similar to some members of the economy being “frozen out” through low wages. 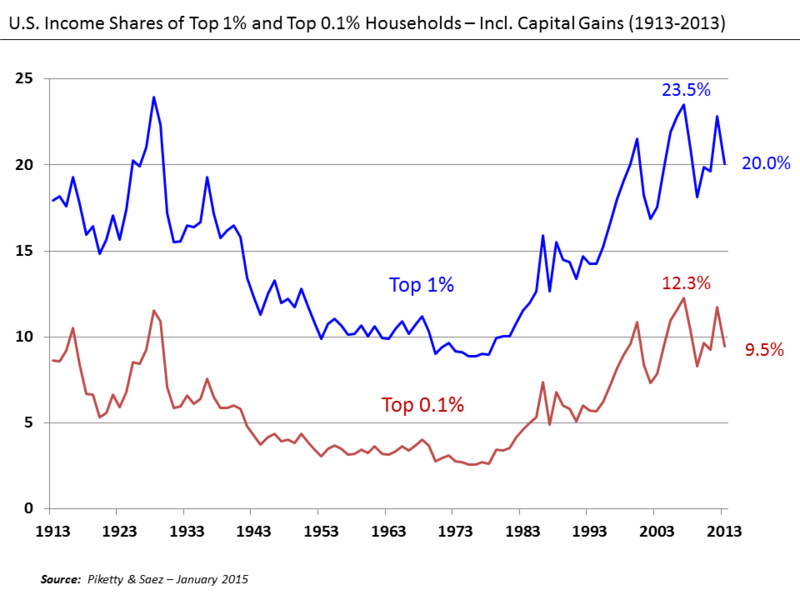 The same forces allow a rising portion of the wages (and other wealth) to go to the very rich. This situation is like steam rising. These individuals do not use very much of their wages to purchase goods and services made with commodities. Instead, they tend to use their wages for services (such as tax avoidance) that are not very energy intensive. Also, they tend to use their wealth in ways that tends to drive up asset prices, without adding true value. For example, buying previously issued shares of stock can have this effect.